Have you ever wished you could repurpose your kitchen desk? 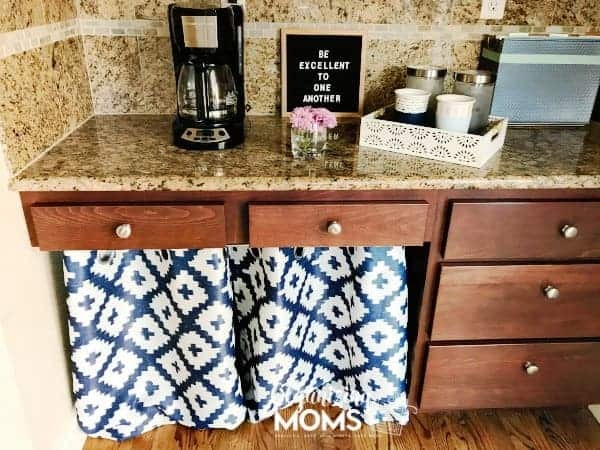 Maybe you’ve been looking for an cheap, easy way to make a coffee bar in your house? Today, I’m going to show you how we turned our kitchen desk into a coffee bar! For a long time, I used our kitchen desk for work. But, it was a real eyesore because we have an open concept kitchen. If I didn’t keep my desk area perfectly organized, it ended up making our whole first floor look really messy! See? Not so neat and tidy looking. In fact, I ended up doing several posts about decluttering my kitchen desk area, but the decluttering never really stuck. It always got messy again! Eventually I moved my office area to another room, and that ended up working out a lot better. 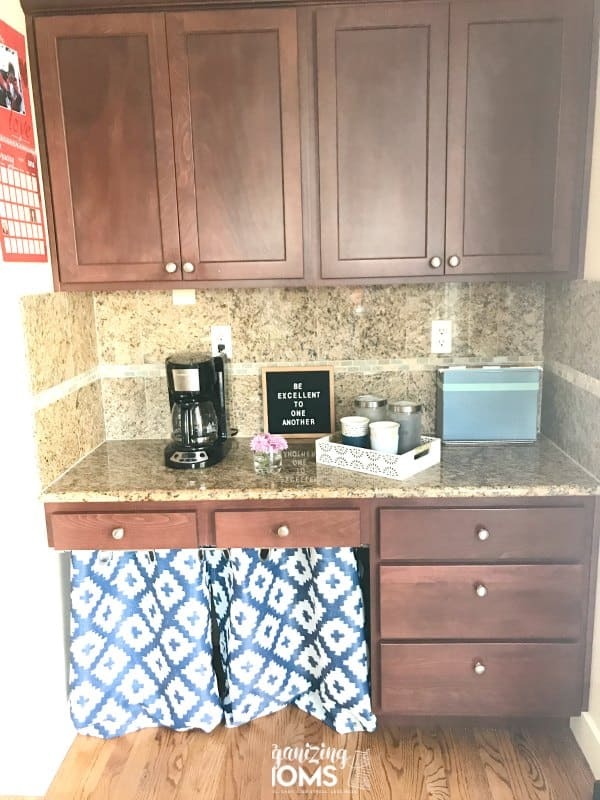 To put the coffee bar together, I took all of my office stuff out, and completely emptied the cabinets and drawers. 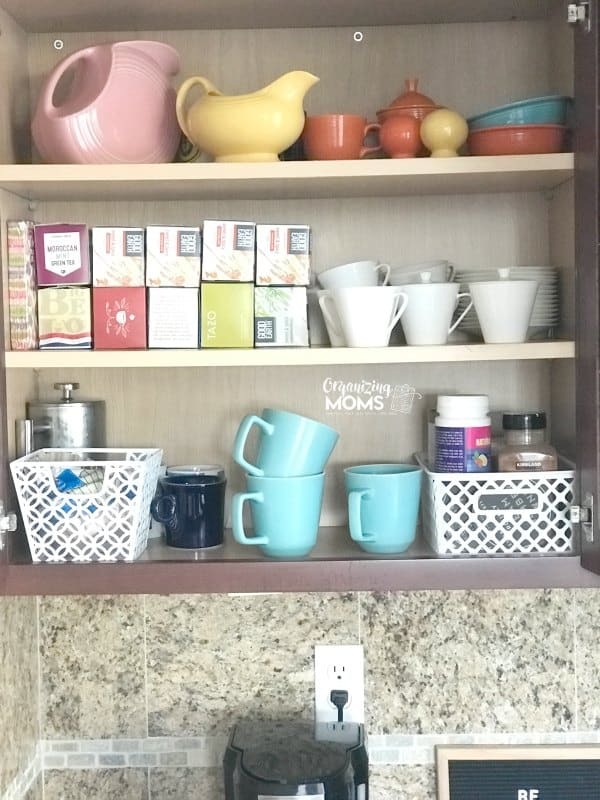 Then, I gathered all of our coffee and tea supplies, and put them into the cabinets. 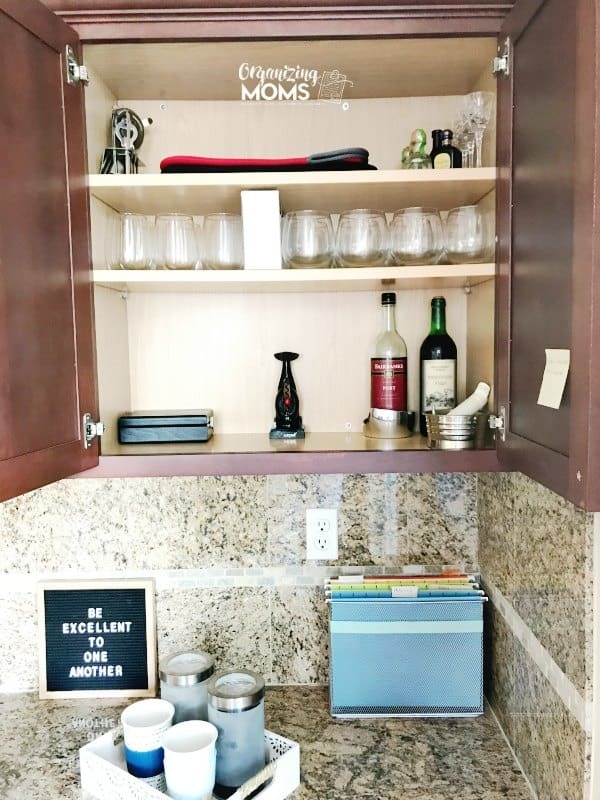 In our second cabinet, we put all of our “wine supplies.” We’re much bigger coffee drinkers than wine drinkers, but over the years we’ve acquired quite a few wine glasses and accessories. So, now they have their own cabinet! 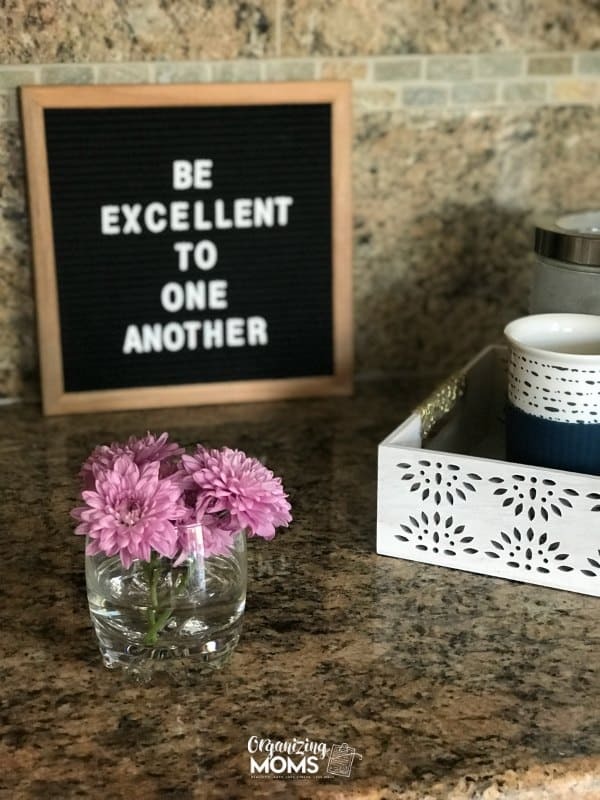 On the countertop, I put a small hanging file box to store papers we need to access more frequently – like spelling lists, takeout menus, and invitations. I picked up some glass canisters from IKEA a while back, so I used those to store our coffee (one for regular and one for decaf). The tray I used is something I found in the cheap section at Target. My favorite part of this whole project is how we ended up using the under-the-desk area. I found some cute cafe curtains on Amazon, and put them up using a simple tension rod. Now, we store our crockpot and some other big kitchen items underneath the desk, but they’re out of sight. We also keep a few bottles of wine in this storage space so they’re easy to grab when we have guests. Here’s a view of the whole coffee bar project with all of the cabinets and drawers closed. I think it looks much more neat and tidy than before when I was using the kitchen desk for work. WANT TO REMEMBER THIS? 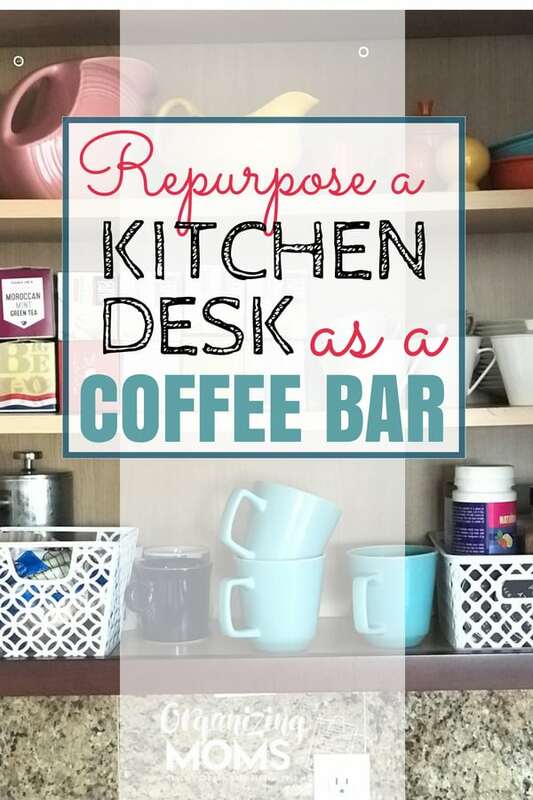 SAVE How We Repurposed A Kitchen Desk as a Coffee Bar TO YOUR FAVORITE PINTEREST BOARD. But, after we were done with the whole project, I couldn’t resist making a cute printable to display in the area. 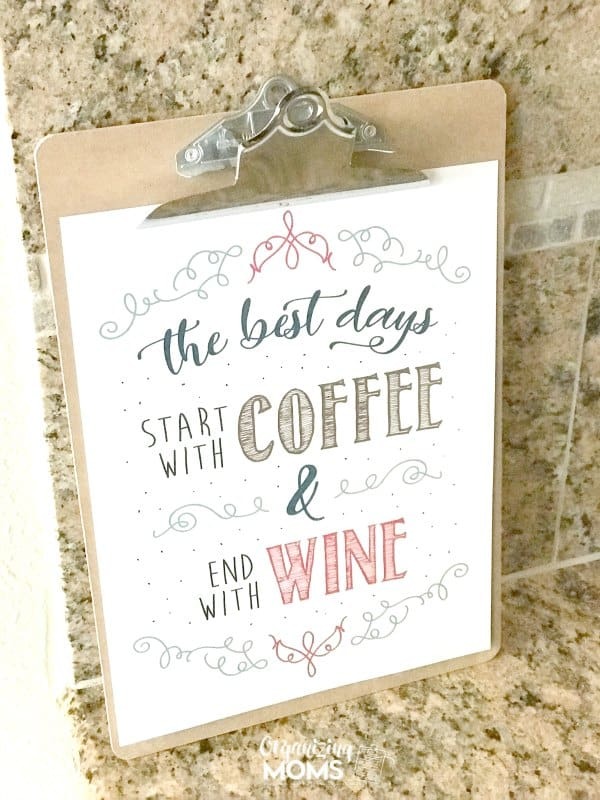 “The best days start with coffee and end with wine” – it perfectly summarizes our newly repurposed kitchen desk! GET ACCESS TO MY FREE PRINTABLES LIBRARY! Subscribe (free!) and I'll send you the password to access my library filled with printables, checklists, guides, and more to help you declutter and get organized! 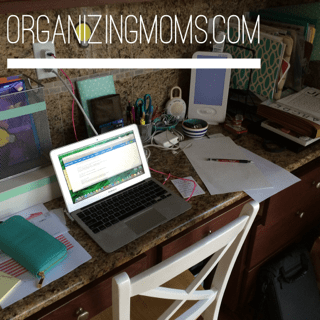 You will also be subscribed to the Organizing Moms newsletter. Success! Now check your email to confirm your subscription. The password to the library is getorganized . Your email confirmation also contains this information.